This one I like enough, but not as much as other dishes. I guess I prefer okra battered and fried, the way my Aunt Norma makes it. The Scientist asked me to add bamia to the rotation, though, so here it is, thank you very much. And he really does like it! And yes...I'll eat it. In large stockpot, bring water, salt, and lamb to a boil. Reduce heat and simmer uncovered for 30 minutes to make a light stock, reduced to approximately 4 cups. After 30 minutes, remove from heat, allow to cool, and chill overnight. Skim hardened fat from the stock. Saute onion and spices in olive oil until translucent, then add garlic and saute 2 more minutes. Add lamb, stock and tomato paste, stir to combine and heat to simmer. 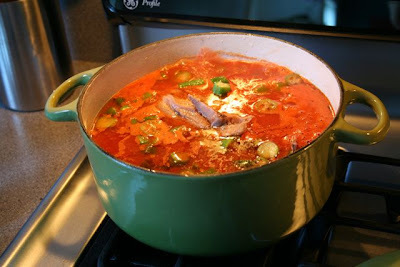 Add okra and sugar, then simmer 15 minutes (do not boil or overcook) or until okra is cooked. Remove from heat, then squeeze lemon juice over everything and stir lightly. Serve over basmati rice. Makes good leftovers! We love bamia over at our house! We make it with beef, though. (picture over here: http://muffintop.wordpress.com/2007/12/13/the-great-kubba-experiment/). Have you ever made a beef and beet stew? That's our other favorite Iraqi beef stew dish. Hi c(h)ristine! I've never had beef and beet stew, and I checked with my hubby and neither has he...I like beets, though, and would be willing to try if I had a recipe. Any suggestions?